Hello everyone. 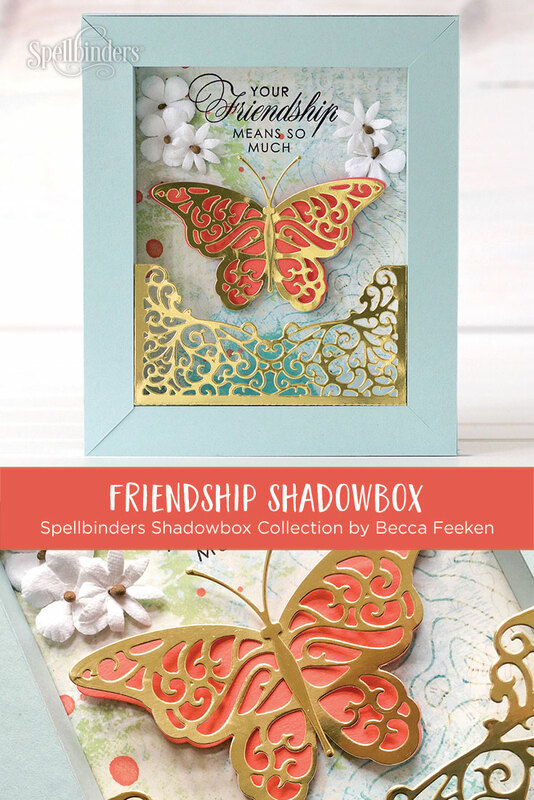 This is Jean Manis, and I am thrilled to be sharing three projects showcasing the Shadowbox by Becca Feeken collection. 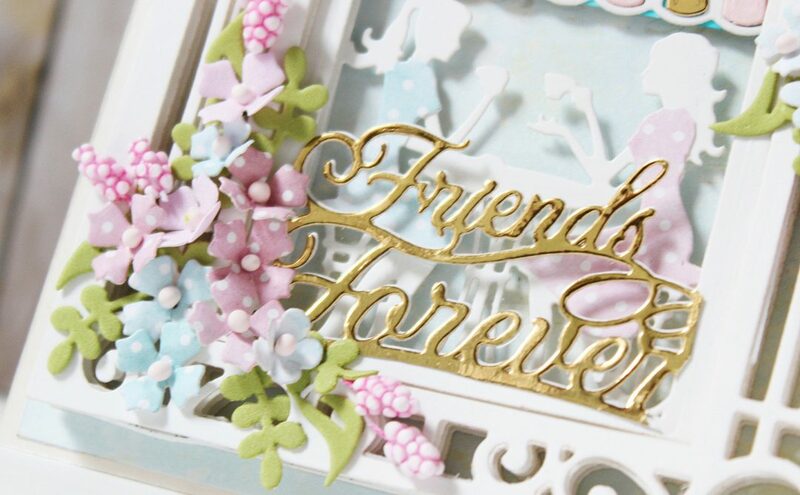 I am passionate about diecutting and this collection is a delight. Let’s take a look! 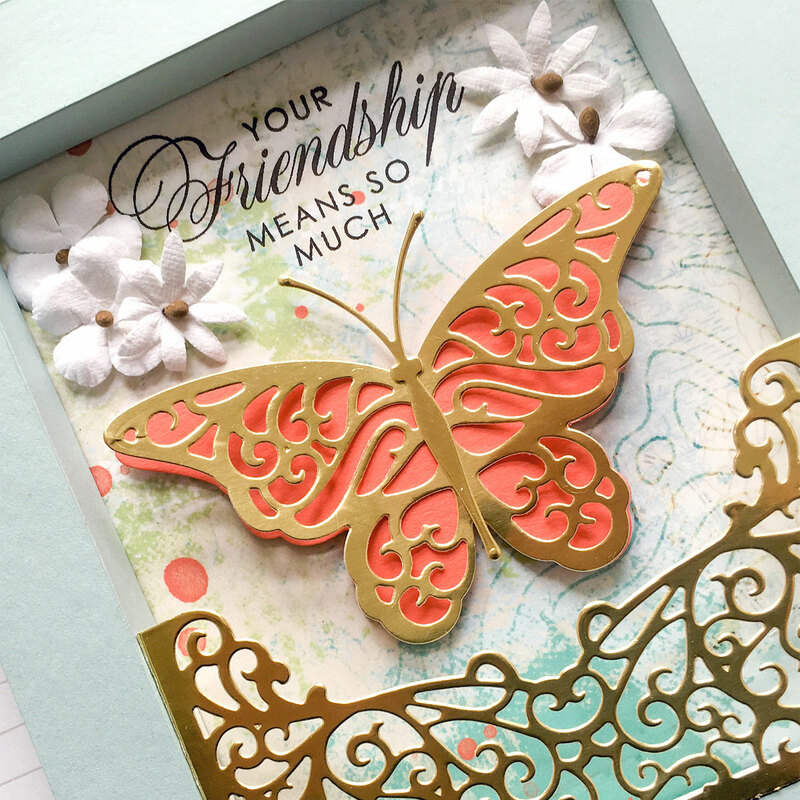 For my first project, I combined elements from the Flutter Wing Butterflies and Filigree Easel and Pocket die sets. 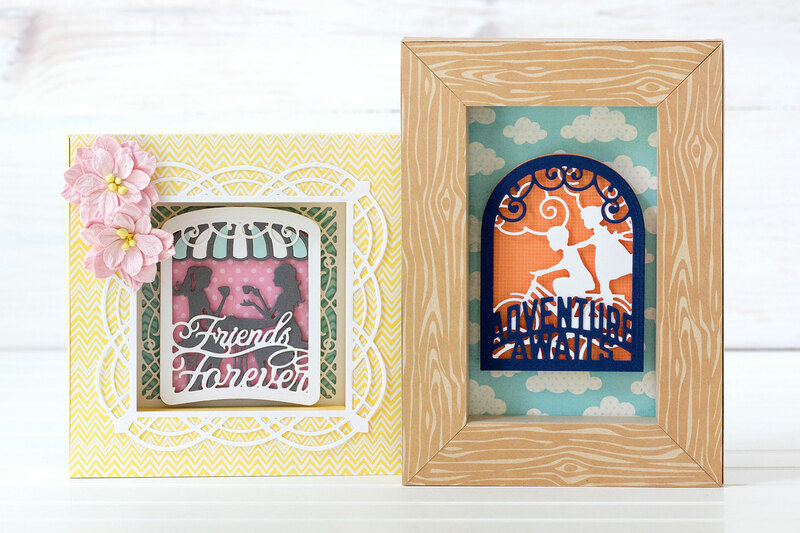 To begin, I created the shadow box from solid cardstock with the ¾” Shadowbox Border die set. The exterior measurements are 5 ¾” x 6 ¾”. The box was sized as such since the easel piece is 4 ¼” wide, therefore the interior measurement needed to be the same. I added the frame width (twice) to the interior measurement to determine the box width. 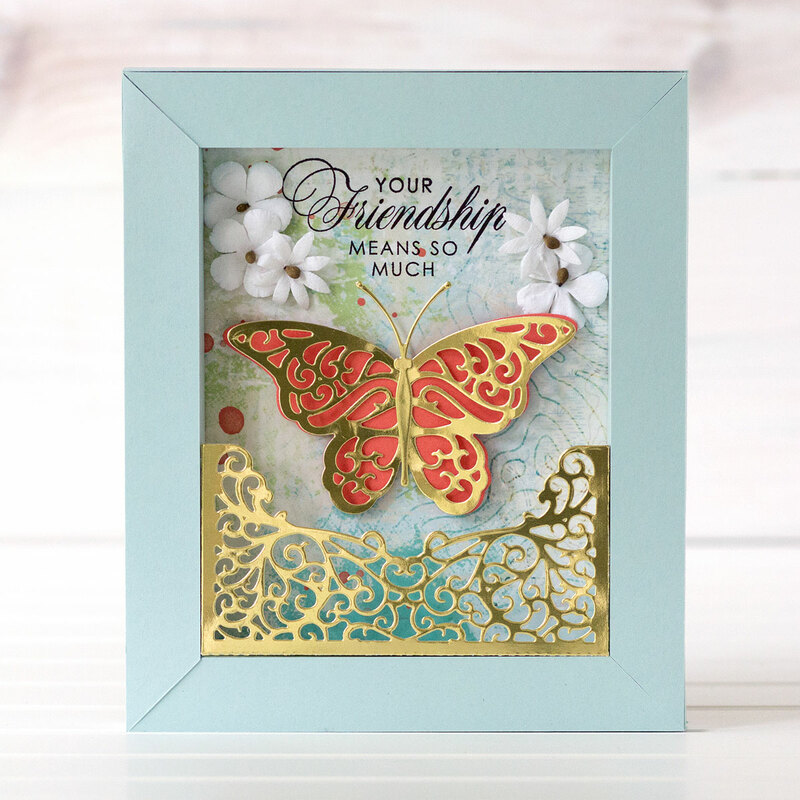 I cut the detailed butterfly and antennae from gold foil and cut the solid butterfly from coral cardstock with the outline dies. I cut the easel from gold foil. I stamped the sentiment in black ink on patterned paper (printed from a digital file). Once the frame was assembled, I adhered the stamped patterned paper to the back. I also attached a piece of chipboard to the back. 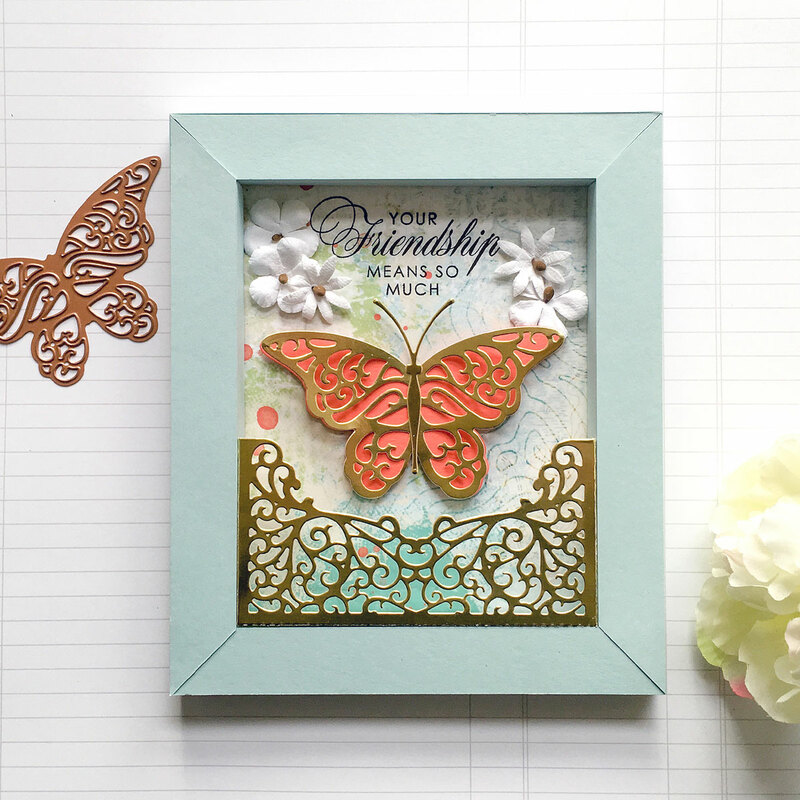 I attached the assembled butterfly to the patterned paper below the sentiment with foam adhesive and glued the easel into the frame. For additional texture and visual interest, I added flowers to the left- and right-upper corners. The second shadow box showcases elements from the Layered Friends Forever Cafe Scene and Adoria Square Frame sets. 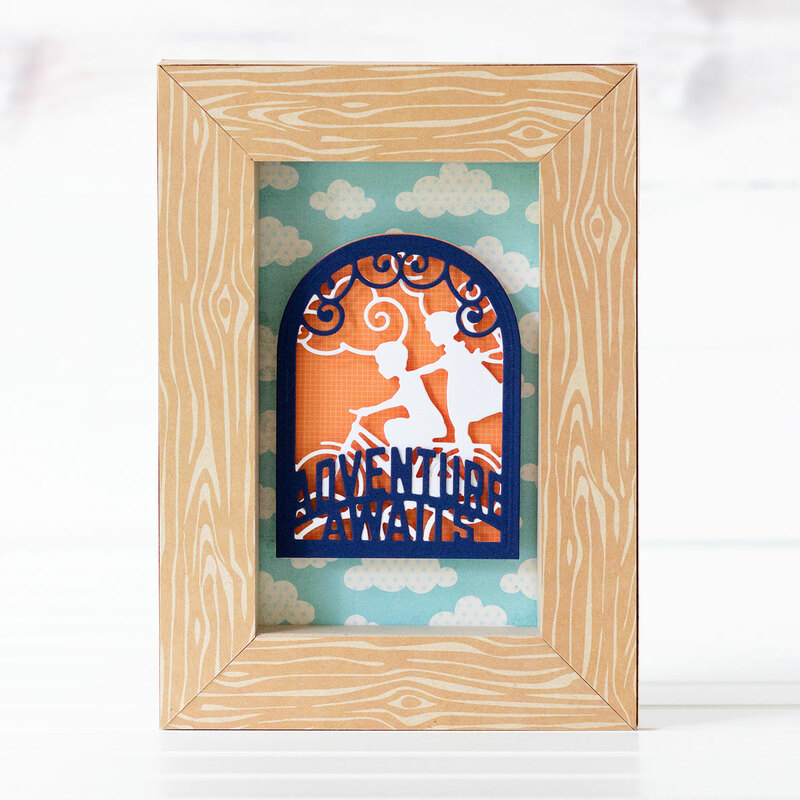 To begin, I created the shadow box from solid cardstock with the 1″ Shadowbox Border die set. The exterior measures 5.4″ square. The box was sized as such since I planned to use the square die in the Adoria set, measuring 3.4″, to create a detailed frame for the shadow box front. I added the frame width of 1″ (twice) to the interior measurement to calculate the box width. I backed the assembled shadow box with patterned paper, to which I first attached a detailed cut-out created with a die in the Adoria set. I also attached a piece of chipboard to the back. For the front, I cut the largest Adoria frame from white cardstock with the detail die and then cut out the center with the square die. I cut patterned paper, which had been trimmed to a 5.4″ square, with the same square die (in the center) to fit over the shadow box front as one piece. I glued the Adoria detailed frame to the patterned paper and then attached the piece to the shadow box front. With the box front and back completed, I was ready to work on the scene. I cut the Café Scene sentiment piece from white cardstock. I cut the silhouette of the friends from gray cardstock to which I inlaid pieces cut from white and blue cardstock to the awning. The back piece was cut from patterned paper. 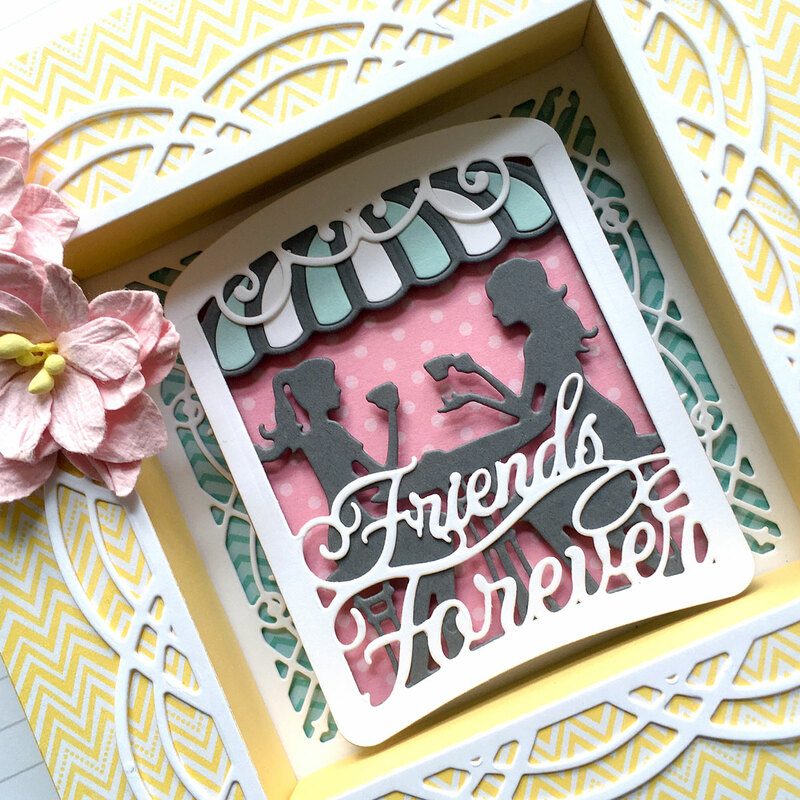 I glued the detailed die-cuts to one another and attached the assembly to the pink background with foam adhesive. I added the assembled scene to the shadow box with two layers of foam adhesive. For additional visual interest, I added preassembled flowers to the left-hand corner of the frame. For my final project, I let patterned paper do the heavy lifting for the design. 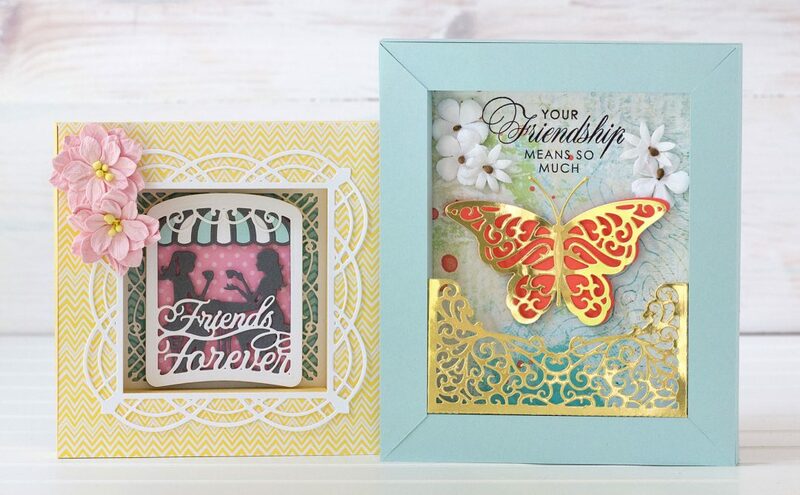 Overall, the design is less detailed than the previous two shadow boxes. That’s the great thing about this collection – there is something for everyone. 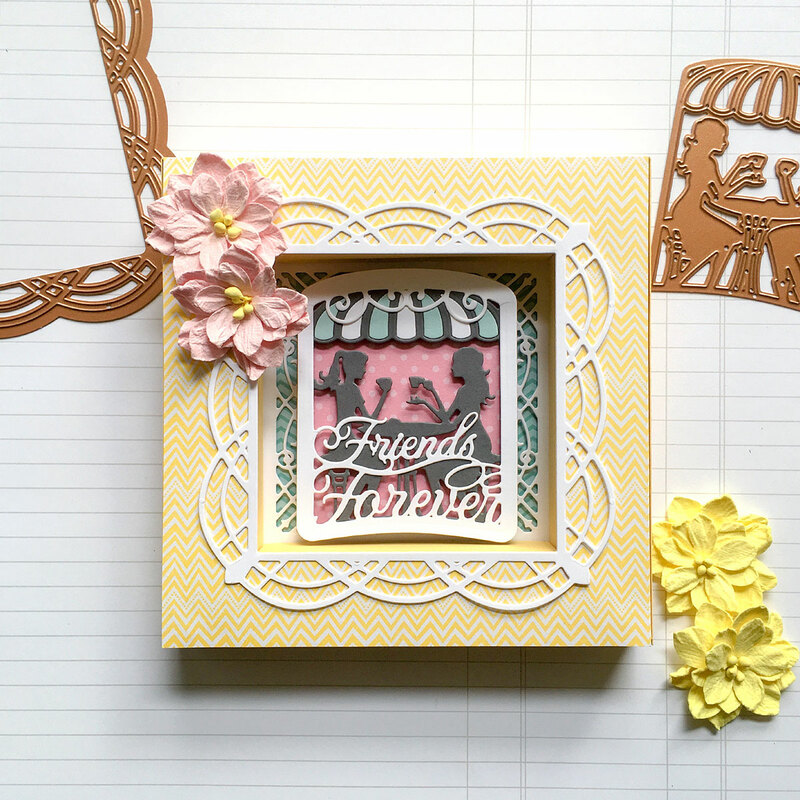 To begin, I created the shadow box from solid cardstock with the 1″ Shadowbox Border die set. The exterior measures 5″ x 7″ square. I covered the frame front and sides with woodgrain patterned paper. 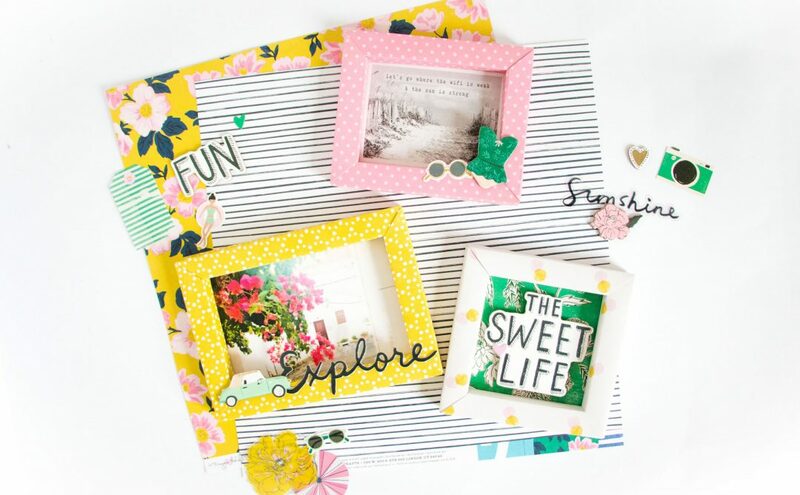 The patterned paper was too light to use to construct the shadow box frame pieces. I backed the assembled frame with cloud-themed patterned paper. I also attached a piece of chipboard to the back. With the frame finished, I worked on the scene. 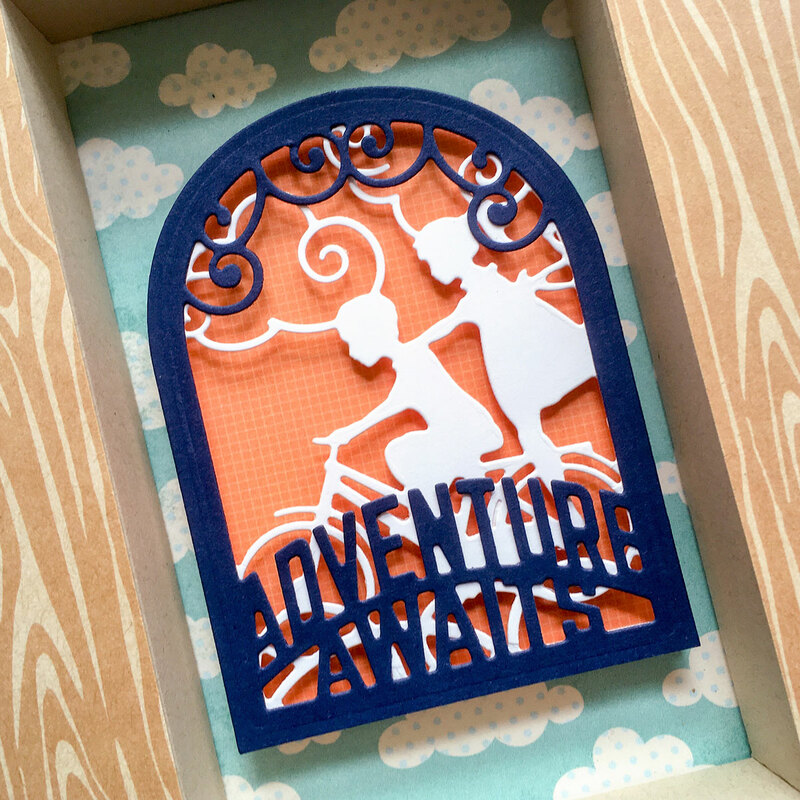 I cut the sentiment piece from navy cardstock and the bicycle scene from white cardstock. The back was cut from orange patterned paper. I glued the detailed die-cuts to one another and attached the assembly to the orange background with foam adhesive. I added the assembled scene to the shadow box with two layers of foam adhesive. I am delighted that you stopped by today. 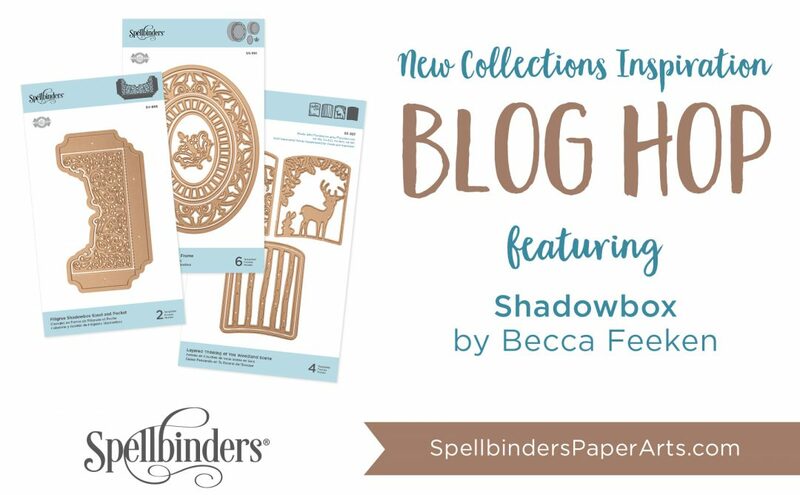 I hope I’ve inspired you to create a shadow box with the elements in this collection no matter what your style!